The Guitar Column: 1982 Ibanez Rocket Roll Formerly Owned By Joe Satriani on eBay! 1982 Ibanez Rocket Roll Formerly Owned By Joe Satriani on eBay! 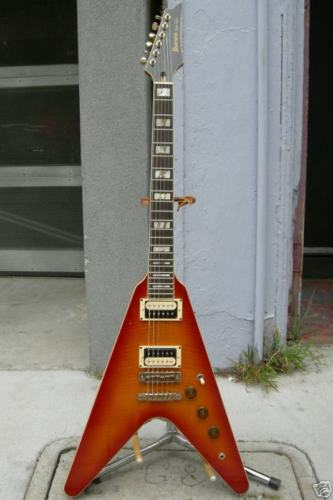 Here's an interesting listing for a 1982 Ibanez Rocket Roll II Flying V on eBay, formerly owned by Joe Satriani! 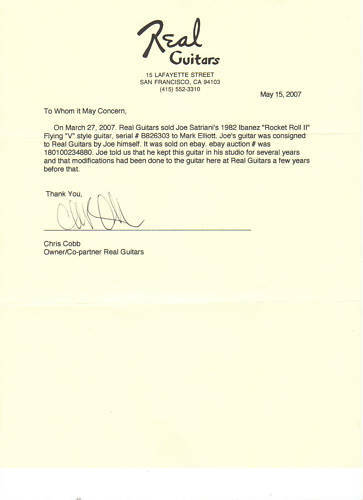 The documentation that comes with this guitar states that it was consigned to Real Guitars in San Francisco by Satriani himself, although according to the seller Satriani could not remember if the guitar was used on any of his recordings. 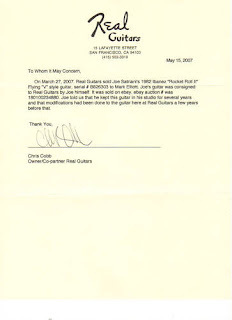 Modifications to the instrument, including the addition of two Seymour Duncan Seth Lover pickups were also done at Real Guitars. Produced for a short time between 1982 and 1983, the Rocket Roll II came a couple of years after the Destroyer II, Ibanez's variation on the Gibson Explorer. Together with the Ibanez Iceman, the Rocket Roll II and Destroyer II were Ibanez's early forays into the hard rock and heavy metal markets and precursors to the shred axes that Ibanez has become so well known for. Do the necessary research if you're getting this guitar for the owned-by-Satriani mojo aspect. The V-styled guitars are awesome. They are returning us to 70's, KISS concerts, women, alcohol, glam rock... I wish I lived that time. Wow! V-styled guitars! This post reminds me of music of 80's and 90's those were real music.. which gives me idea to write my essay about "real" music. The guitar is very cool! But! ... It will cost too much just because on it playing Satriani. Lovely guitar - music is the soul of life and if one can afford to buy this guitar, it will be worth it!